Whole Foods has always been known as a pioneer in the world of organic produce. However, the company's newest food labeling initiative is causing frustration among farmers. The new program involves a Responsibly Grown rating system, explained CNBC. The new system aims to find out more about supply chain practices for produce suppliers. The company is looking beyond simply growing factors and further into labor and sustainable sourcing. "We're asking suppliers a series of questions about a range of topics: soil management, pesticide use and pest management, water conservation, energy use and greenhouse gases, topics like farm-worker welfare," noted Global Produce Coordinator at Whole Foods Matt Rogers to the source. 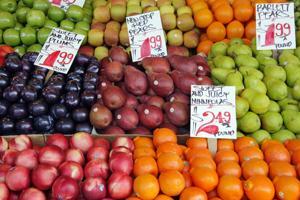 Produce suppliers would be charged a fee to gain access to the Whole Food's survey. From there, they will be asked to provide key information regarding their produce practices. Upon completion, Whole Foods will assign participants with a rating of either good, better or best, reported CNBC. If a supplier fails to meet any of the three mentioned criteria, they will be not be assigned any rating at all. While the program was meant to add an extra level of transparency within supply chains, farmers are frustrated by the fact that the labeling system may make their products pale in comparison, according to The Atlantic. Organic farmers go through a certification process with stringent requirements and a hefty fee. Many of the standards these farmers are held to are excluded from the Responsibly Grown rating system, explained the source. Another pain point in this produce process lies in the fact that the Whole Foods questionnaire is unmonitored. Whole Foods goes off nothing but the word of their suppliers, with no third party verifying their claims, reported The Atlantic. Technically speaking, program participants could doctor their responses to guarantee them a high rating. While the company maintains that the roll-out of this system is only intended to hold its supply chains to the highest standard, it has been careful to assure consumers that an organic certification is still the epitome of success. "Certified organic is really still the gold standard in terms of sustainable agriculture practices," Rogers said to CNBC. Whether or not these practices truly improve supply chain practices is an unanswered question. Currently, the system allows conventional farmers to receive higher ratings despite lower standards. The Atlantic explained that the program permits companies to implement small improvements such as recycling programs or minor removal of pesticides to boost ratings. While the intentions are pure, organic farmers believe these efforts are minimal compared to their practices, noted the source. Whole Foods has already taken steps back from the original version of this program in order to assuage farmer frustration. According to Civil Eats, the company has now agreed to give any organically certified produce an automatic 'good' rating on the Responsibly Grown scale. Moreover, the company will work closely with the California Certified Organic Farmers to ensure the rating system keeps organic practices at a high standard.